My first introduction to dukkah was in South Africa, back in 2007. Did I ever tell you that my husband is from there? Yes, he hails from the land of lions and wildebeest (bet you didn’t know how to spell that). Anyway, we were grabbing a bite at a local restaurant where they served us dukkah, bread and olive oil as a prelude to our meal. At the time, I had absolutely no clue what it was but quickly learned that this complimentary nibble was quite common throughout the country. So what is dukkah, exactly? Pronounced ‘doo-ka’ it’s an Egyptian spice blend made up of toasted nuts and seeds. It reminds me of an everything bagel, minus the onion (and the bagel). The idea is to dunk your bread in olive oil first, and then swipe it through the dukkah. It’s nice and crunchy and has a wonderfully unique flavor. Fast forward to present day and a new thought: let’s bake it on the bread. The concept of dukkah might seem a bit foreign to you, but it is very easy to make at home. All you need is a food processor. I prefer making it myself because most store-bought blends are a little too cumin heavy for my taste. In fact, I leave out the cumin altogether in my recipe. It gets an Italian upgrade with some fennel seeds instead. To clarify this crazy bread talk, please visit my beginner’s guide for all things sourdough. I had my best friend read this post prior to publishing, and she asked me flat out- so what’s the point of baking it on the bread? Why not just dunk? Here’s why: because you get to do things like toast it golden, rub it with garlic, and then submerge its crunchy goodness into soup…. 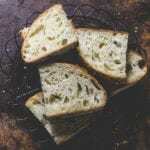 The seeds and spices create this harmonious paring that’s different from the usual bread-dunking suspects. I will warn you though, the dukkah will fly all over the place when you try to cut the bread! You see? We’ve now come full circle. Store your dukkah in an air-tight container in the fridge or freezer until ready to use. 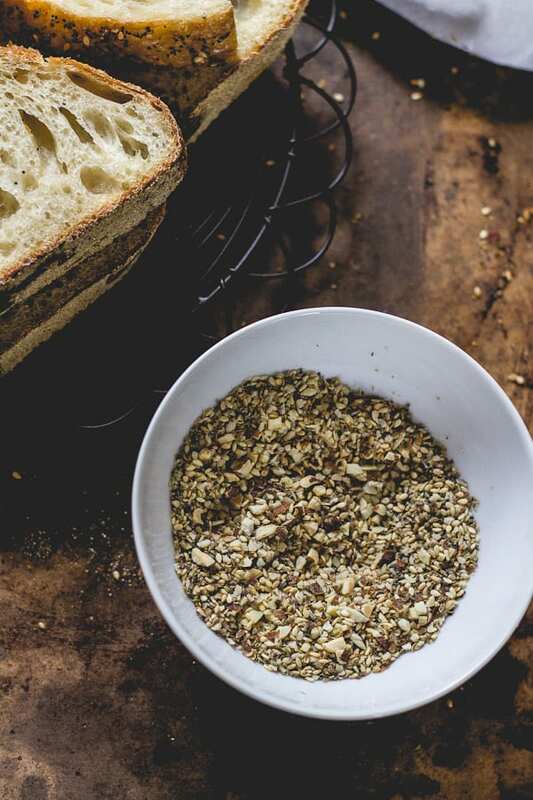 Save any dukkah seeds that fall off your bread when slicing. Sprinkle them on salads, soups and croutons. I like to bake my bread dark, which means that the almonds will get pretty toasty (which I don’t mind). You can always reduce the oven temperature to control the browning rate. Bake at 450 F for 20 minutes (covered), and then lower the temperature to 400 F. Continue to bake for an additional 40 minutes until golden (uncovered). This bread is best if consumed within the first 1-2 days of baking. If you prefer, you can cut the dough in half to make 2 small loaves. Eat one + freeze one. To freeze, wrap your bread in plastic wrap and then in foil. It should last up to 3 months. For the dukkah, place the almonds, fennel and coriander seeds into a food processor. Pulse until coarsely chopped. You want the texture not too chunky, yet not too fine. Stir in the sesame and poppy seeds. Store in an air-tight container until ready to use. To make the dough: in a large bowl, combine the starter, water and bread flour. Squish everything together with your hands until all of the flour is absorbed. Cover with plastic wrap and let it rest for 1 hour. Add the salt + ½ tsp. of water (to help it dissolve). Lift and fold the dough over itself several times, and squish with your hands to incorporate. The dough will tear slightly as you fold, and the salt will not fully dissolve. Don’t worry- this is normal. Work the dough as best you can until it comes back together into a rough ball. At this point, you shouldn’t feel any grains of salt beneath your hands. Bulk fermentation: Cover your bowl with plastic wrap and a clean kitchen towel. Leave it in a warm, sunny spot to rise. Your dough is ready when it no longer looks dense, and has increased in volume about 1½- 2x its original size. This can take anywhere from 3-12 hours depending on the temperature of your ingredients, the potency of your starter, and surrounding environment. *See note below. Stretch & fold: To strengthen your dough, do a series of stretch and folds every 30 minutes for 2 hours during bulk fermentation. Simply gather a portion of the dough, stretch it upwards and then fold it over itself. Rotate the bowl ¼ turn, and repeat until you have come full circle. You will have completed 4 folds. Cut the dough: When your dough has risen nicely, it’s time to cut and shape the dough. Divide your work surface in half; lightly flour one side (for cutting) and leave the other half clean (for shaping). Remove the dough from the bowl, and place onto the floured section so that it does not stick. You do not need to ‘punch down’ the dough; it will gently deflate as you fold and shape it. Cut the dough in half to make 2 loaves, or leave it whole for a single loaf. Shape the dough: Use a bench scraper to move your dough to the non-floured section. Gather the dough, one side at a time, and fold it into the center. Flip the dough over and place it seam side down. Using your hands, gently cup the sides of the dough and rotate it, using quarter turns in a circular motion. You can also pull it towards you to even out the shape. Repeat this process until you are happy with its appearance. Brush away any excess flour from the dough. 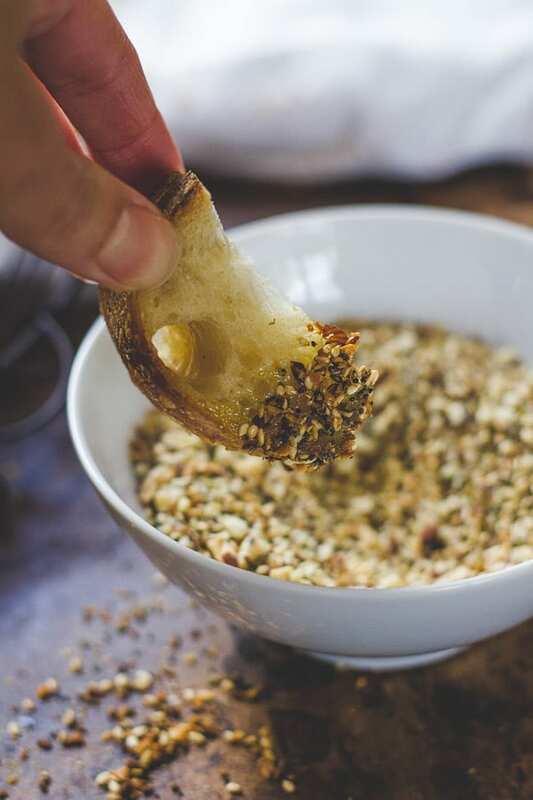 To coat the dough, add all of your dukkah to a large bowl. Roll the dough around in the seed mixture until well coated. If there is too much flour on the dough, the dukkah will not stick. Second rise: Place your seeded dough into a cloth lined basket. Cover with plastic wrap and refrigerate overnight. Prepare the baking vessel: When you are ready to bake, remove the dough from the fridge and allow it to rest for about ½ hour (in the bowl). Preheat your oven to 450F. Generously coat the bottom of a Dutch oven with cornmeal or line with parchment paper to prevent sticking (I prefer the latter option). Sprinkle a good amount of cornmeal on top of the dough as well (this will be the bottom once it’s flipped over). Carefully invert the dough into the pot, cornmeal side down. Slashing the dough: Right before your bread goes into the oven, make a shallow slash about 2 inches long in the center of the dough. Use a bread lame, sharp pairing or serrated knife. Bake the bread: Place your bread into the oven (lid on) and bake for 20 minutes. Remove the lid, and continue to bake (uncovered) for an additional 40 minutes or until deep, golden brown. I like to bake my bread dark, but if at any point the top is getting too brown for your liking, turn down the oven to 400 F. During the last 10 minutes of baking, crack open the oven door. This allows the moisture to escape, leaving your bread with a crisp crust. You can also take the internal temperature of your bread to double check that it is done. For sourdough, it should read about 205 F.
Cool: Remove the bread from the oven, and cool on a wire rack for at least an hour before slicing. The longer you wait, the easier it will be to cut. Don’t slice into it too soon or else the texture will be gummy! Beautiful bread! And double the dukah! love it. I was on Safari twice in South Africa an never got to experience this! I feel robbed!! I love the sound of it, especially on crusty bread! It reminds me very slightly of kimmelweck rolls in Buffalo, New York. What a gorgeous bread, this would not last long in my kitchen! Wow…just beautiful!!! Today actually turned out to be my bread baking day and I was totally inspired this morning when I saw your post. I didn’t have everything I needed for the dukkah so I went with a toasted sesame loaf that actually includes them inside and out. It might just be my new favorite…I’m guessing until I try your dukkah (next on the list) Do you think you could incorporate some of the mixture into the dough? The sesame seemed to do just fine both inside and out. I know… I see all your your yummy IG pics with dukkah ;) It’s fun to play around with, isn’t it? WOW!! This sounds so good – crunch, flavor, and such wonderful texture. You make the most beautiful and tempting breads. This one is completely new to me, and it sounds great. Also, once again, I have to compliment you on your beautiful and very instructive photographs. Bravissima! What a delicious dip for sourdough! This looks like such a yummy combination, Emilie. Great recipes and photos! 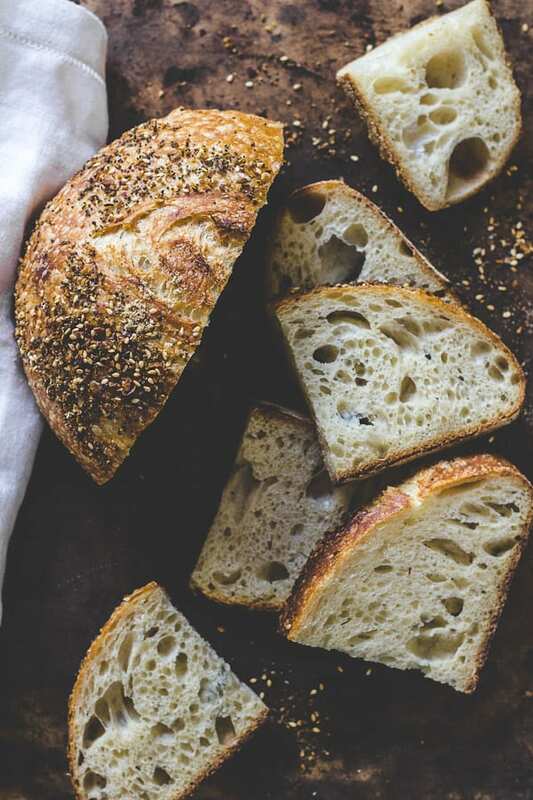 Great looking bread Em and I love the idea of dukkah coating. I am definitely going to try it. Beautiful bread! I love to bake bread too and have never heard of the last part to harden the crust? Must try! This recipe looks delicious…what kind/brand of flour do you like best? What a gorgeous loaf of sourdough and a beautiful crumb too! Definitely going to try this with home milled flour! Thank you for sharing! Is this made with a 100% hydration starter? Yes it is. You can read the breakdown method right after the 3rd photo in the post. Thank you so much! I have two left hands in the kitchen, I hate cooking. When I am asked to bring something for a school meeting sweat breakes out. Yes I am the one bringing the popcorn… My partner loves to cook, he comes home after a ten hour work day and starts cooking because it relaxes him! I cannot get my head around it, amazing. Then my sister in law showed me how to make sourdough bread and something clicked. Maybe it is the slowness of it all, plus only two or three ingredients and not a whole list that makes me nervous… I browsed the internet to find a recipe I could understand and follow and stumbled on you blog. Can you believe I made my own starter? Then I went on to make the Dukkah bread and wow, I did it!! Thank you so much for explaining it all so clearly, step by step. You definitly made the kitchen a less scary place for me! I have this bread rising right now. It is beautiful. I added a bit of the dukkah topping as I did my stretch and folds. I couldn’t help myself. …. I am a bit confused. When I have seeded the dough, before it’s final rise in the refrigerator, is the seeded side down in the cloth lined basket? what a gorgeous piece of art that i want to replicate and devour. but i need some help, if you don’t mind? what exactly do you mean by bread flour, is that considered a strong flour? i live in spain and am only able to find wheat and spelt flour (whole and white). and for environmental and health reasons i would prefer to use local organic flour.. i have a sourdough starter that i have been feeding white organic wheat flour. i have yet to make a loaf as i am trying to find the right recipe to work with. what would you suggest i use to achieve your bread here? thank you in advance for your guidance. Hi there! 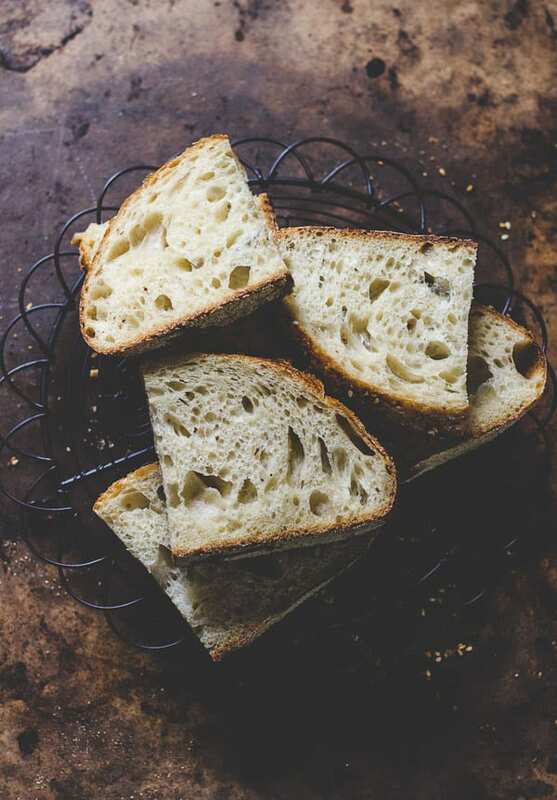 Bread flour is higher in protein than regular flour or ‘plain flour’. 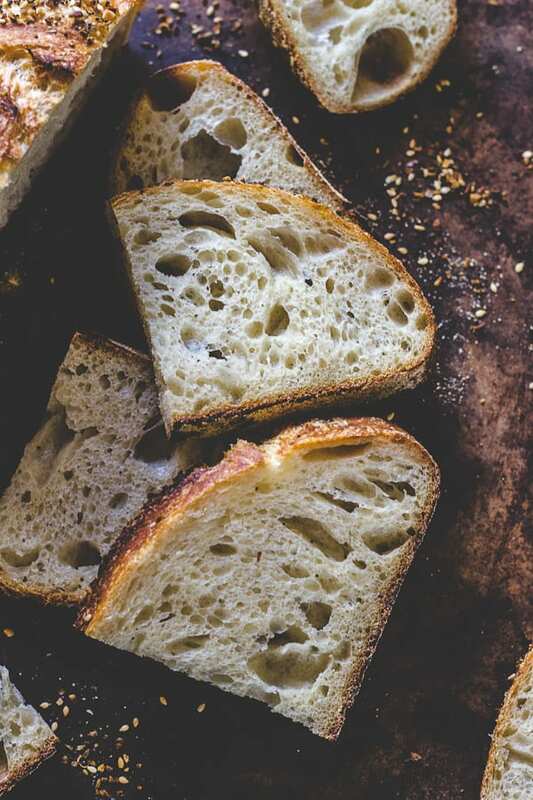 I think your equivalent is either ‘baker’s flour’ or ‘strong flour.’ This type of flour is preferred in bread baking for better gluten development in the bread. It adds excellent structure and texture. However, if you can’t find it, substitute with what you have (white organic wheat flour). The texture will be slightly different, but it’s a good place to start! Good luck! Happy Baking! Thank you for the great recipes! I am excited to try this one, but I am worried about the proving in cloth step…. I have tried this on numerous occasions but have never managed to do it without the dough completely sticking to the cloth. Last time I even used way more flour than I thought I would need! Any suggestions? Hello, I made your sourdough noir this past weekend and loved it. I made one big loaf. 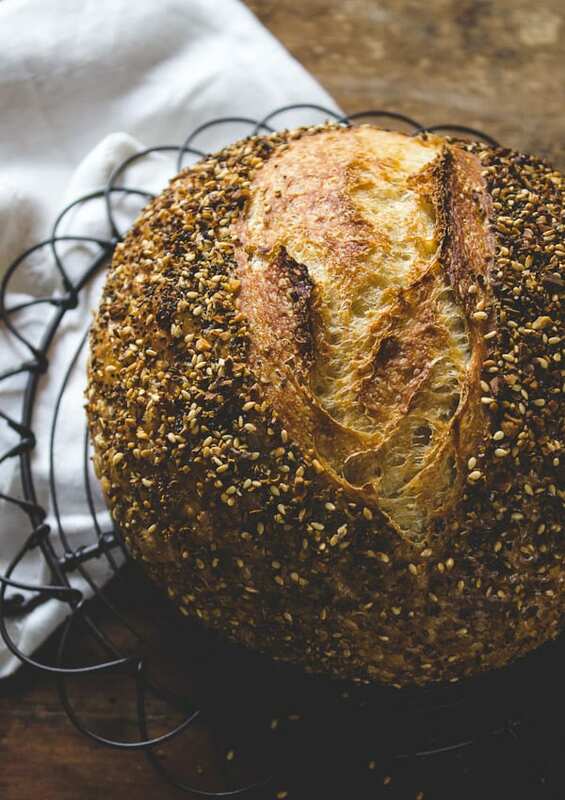 I want to try this dukkah recipe this weekend, but split it into two loaves instead. I want to buy the proofing baskets but I never know what size to buy. What size do you use for a recipe like this, for each half of the dough? Also, do you have any tips for preventing burning on the bottom? My sourdough noir did burn a bit, and also got kind of stuck to the dutch oven. I did use the cornmeal as suggested. Do you have any advice on Sourdough Rye? I’ve had 2 failures. Trying your Dukkah recipe but with Rye starter and just Caraway Seeds in the dough. ? Think it will work better because it has more water in it? We’ll see what happens. Your Sourdough for beginners is so excellent. I’ve been at this for years and missed Sourdough when I went to baking school. Have made 6 successful rounds. Delicious!!! Any advice on Rye would be welcome. Thank you so much.